Printing from wood engravings is the oldest paper printing technology in the world. After the 16th century, the process was eclipsed by copperplate, and other forms of engraving. Enthusiasm for the art of wood engraving was revitalised in the 18th century, with another dip in popularity at the end of the 19th century due to the advent of photography. Another Renaissance occurred in the early 1900s, when relatively inexpensive prints from wood engravings were considered artworks in themselves. American artist Lynd Ward (1905-85) was famous for his wood engraved wordless graphic novels. 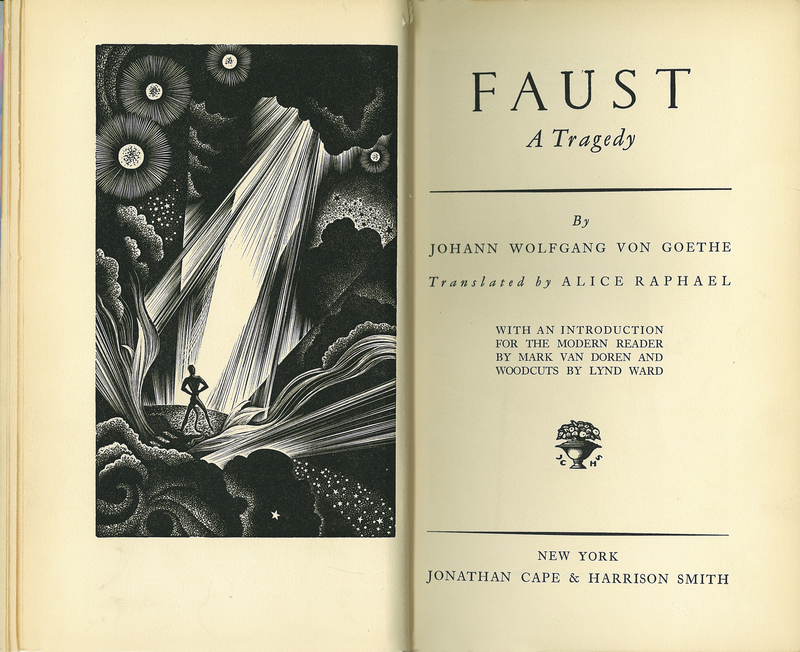 This volume contains his work as the frontispiece to a 1930 translation of Goethe’s Faust (first published in 1808). Johann Wolfgang von Goethe, “Faust: A Tragedy,” ourheritage.ac.nz | OUR Heritage, accessed April 26, 2019, http://ourheritage.ac.nz/items/show/10706.